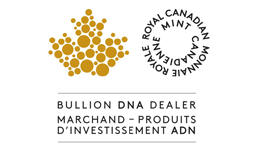 The Royal Canadian Mint operates one of the most technically advanced and respected gold and silver refineries in the world, producing bars, wafers and custom products. In operation since 1911, their refinery services are among the largest in the industry. They began refining gold to 9999 fine purity in the mid-1960’s. In 1982, their refinery became the worlds’ first to produce 9999 bullion coins, an achievement surpassed in 1998 when they reached “five nines” purity levels. Today, they are even able to produce granulation gold that is 99999 fine.